While blogging is not as easy as how some people may see it, I am always thankful to have an outlet to share my thoughts and to have gained exposure, made like-minded friends and received sponsorship opportunities since A Happy Mum started in 2011. One of the opportunities that excites me most is going for sponsored family photoshoots. Thanks to a spontaneous hubby and two lovely kiddos who also like to capture precious moments, every of our photoshoot has left behind memories that would last us for a lifetime. 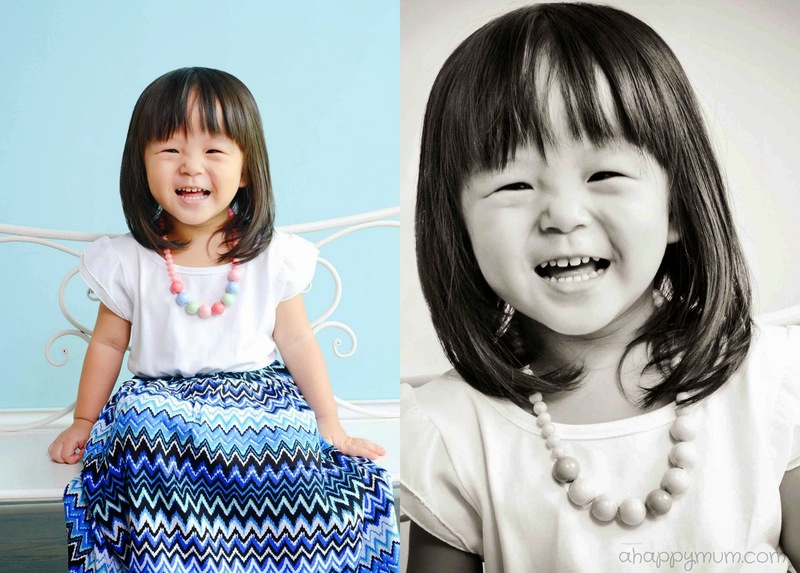 Thanks to Kids Pictures, we were kindly invited to do a studio family photoshoot in August. Started in 2000, Kids Pictures is a pioneer photography boutique studio which specialises in infants, kids and family photography. 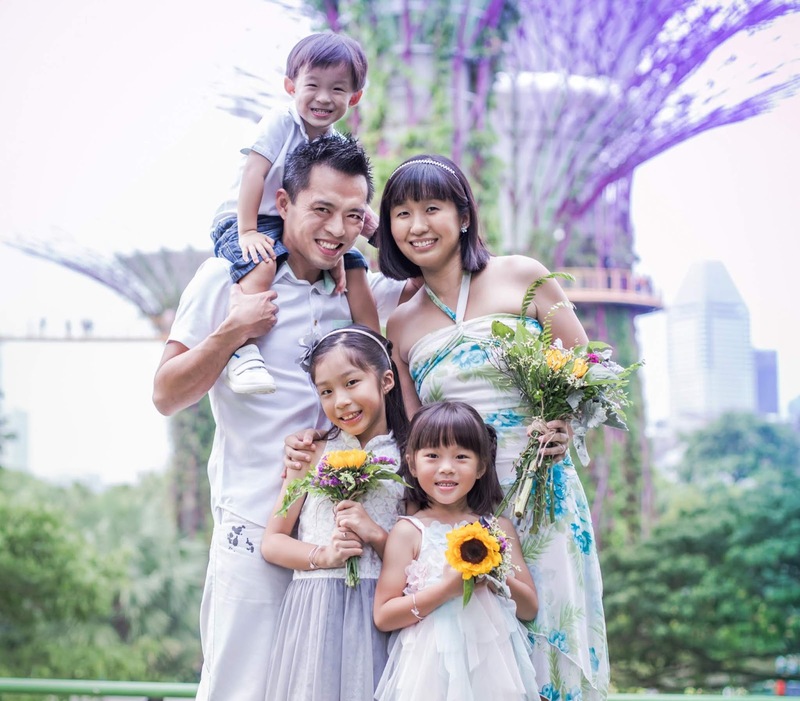 Through the years, they have grown to become a renowned family-oriented photography provider both locally and internationally. In fact, it is an honour for them to have had the privilege to capture precious photos for royal families around the world. For the first time, we wore matching family outfits in a photoshoot! Thanks to our kind apparel sponsor MidouCeur (read our previous review here), four of us were clad in the Surfer Zag outfits. Instead of the usual girly hues, it was refreshing to see us dressed in white and blue for a change. Apart from showing you all the gorgeous shots captured that day, I would also like to share with you a handful of things that impressed me about Kids Pictures. Excluding the time used in preparing the backdrop and for us to get changed, the entire shoot took less than 30 minutes. Yes, it was definitely the fastest shoot we have done so far. Previously, it would take us on average 1-2 hours, sometimes even more, and we would have time to change into more outfits, try out more poses or even have snack breaks for the kids. Thus, I was a little surprised and you might even say a little skeptical when it was a wrap. That said, I began to think about the benefits of having a short photoshoot and while that means you might have less varied poses in less outfits, it would also mean many things like less tired kids and more time to spend as family on a precious weekend. You can never have the best of both worlds, right? When I received the pictures, I was even more surprised at how Yan, the photographer, managed to capture so many lovely smiles and happy looks in such a short span of time. That, I must say, is true efficiency and professionalism. You know how sometimes portraits just end up looking more posed than natural? For Ariel, much of it depends on her mood whether she would do what she is told or laugh for the camera. For Angel, I realise although she is usually cooperative and would smile, many a time it would end up looking posed and just does not exude a look of true joy. I like to avoid posed shots as much as possible and it was a relief to see that many of our pictures turned out to be informal and natural looking. I have to say part of the credit goes to the hubby and I for being quite professional 'clowns' and have many tricks up our sleeves to attract the attention of the kids and make them giggle, smile and laugh. However, it would not have been possible if we did not have a photographer and an assistant who knew how to capture these shots at the perfect moment. It surprised me a little and was in fact quite heartening to see the kind folks from Kids Pictures getting on their fours to play tickling games or racing with the kids in a bid to make them laugh from the heart. See this shot above of the girls kissing Daddy? It's one of my absolute favourites. I have to first confess that I was a little envious of this scene and wondered why I was not called on set after what seemed like half the shoot while the hubby got to do shots like this with the kids. Wait, okay, I was the one who suggested for them to kiss him together but you know, this stay-at-home mummy just wanted to be part of the affectionate scene. It was when I saw how nicely the pictures turned out that a big smile came to my face and I realised how precious they would be, just Daddy being kissed by his precious darlings who look up to him and see him as the hero in their lives. Such a special daddy-daughter moment, right? Besides this shot, there was also a handful of others that I felt captured us in the right light and flattering angles. I also love that the editing of the pictures was done to enhance a natural look and personally, I think they did a great job with the framing, cropping and photo effects which added emphasis and variation. One of the things that struck me most about the photographer was her bubbly, positive self. Yes, I do think that photographers who work with children need to be more animated and dynamic than usual but Yan was so zestful and full of life that it was inspiring, even to me. Besides being friendly and responsive, what impressed me was that Kids Pictures made an effort to personally pass us our printouts and soft copies when we were all feeling under the weather. No, I'm not saying it will be fair for them to do this for every customer but this instance just goes to show how they are willing to go the extra mile when it comes to providing service. Towards the end of the shoot, the little one was more in the mood for play and so I was able to have some brief moments with my firstborn. I especially love the shots of the two of us where she hugged me from behind and it somehow made me realise just how alike we are, not only in looks but in personality as well. Pictures, they have such a magical way of saying a thousand words, don't you think so too? I don't know how to describe it to you but these family shots just touch my heart somehow and I am thankful to have so many priceless memories to last for a lifetime. Specially for A Happy Mum readers! 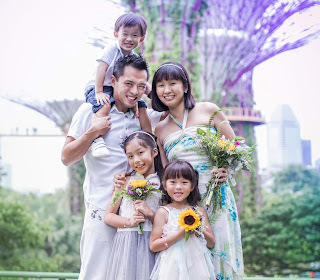 Kids Pictures is offering a complimentary 8 x 10" reprint (worth S$45) with any package signed. Simply quote "HappySummerliciousMum" (No, this was not invented by me) to enjoy this offer until 31 Dec 2014. For more information on Kids Pictures, visit their website or Facebook page. Disclosure: We were invited for a sponsored family photoshoot by Kids Pictures. All opinions are our own. And i also personally liked Ariel's 'innnocent' looks in the family of four. Haha thanks for doing it despite you are not really into photo taking, I agree these memories are priceless and once gone, never to return again. You know what, when we grow old and frail, we will be glad to have these precious pictures for keepsake! =) Thanks for checking out the new look on the blog! Wow I love these shots! They are so natural. I think my fav has to be the one of Ariel and Angel on the little bench. So gorgeous! Wow half an hour inclusive of outfit changes and snacks? Awesome! Aww thanks! I love that cute little bench too. Fits the two of them perfectly! =) We only had two outfits as you can see (hubby only one!) so outfit changes were really quick. No snack breaks as everything happened very fast. Excluding backdrop setting up and changing of clothes, the photo taking took half an hour or less only! These are such gorgeously beautiful photos and you've put them to good use to give the blog a refreshed coordinated look! Love it very much. :) Good job Momma! These are beautiful memories captured of the family and I love the matchy matchy outfits too. Great work done for the new look on the blog. Your family photo always brings a smile. Thanks Susan! Nice to know the photos can make you smile! Hee! Oh yeah, he's being nice by leaving his mark on my blog every once in a very BLUE moon! =) Haha.